We’re glad to show a preview of the C6AGW QSL-card. I2VGW informs that cards will be shipped as soon as possible, when all QSLs will be printed. For updates please refer to the official website http://www.mdxc.org/c6agw/ where will be also available further details about shipping operations. We’ve been very proud to follow in a special way the Bahamas round-trip experience by I2AGW. MDXC DXpedition service is free and available even to not-members DXpeditioners. Here are our DX-pedition support policies. Click on the picture to watch the full size preview and the back side of the card. Have you already seen the video and listened to Bahamas live souds? A Must to see and listen! 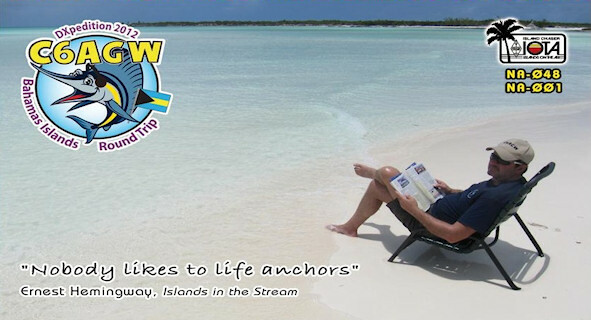 Live from Bahamas: new emotions, sounds, pics and memories of C6AGW DXpedition !